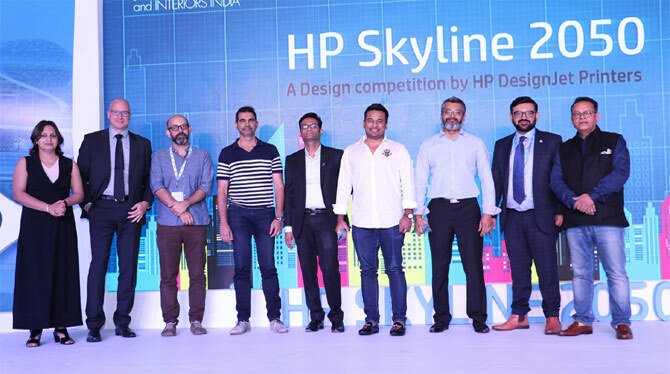 HP India has unveiled the top designs depicting the future of Indian cities at the grand finale of HP Skyline 2050 – a competition for practicing architects & structural engineers in India, launched two months ago. Aimed at showcasing the future frontiers of design enabled by technology, the competition required the participants to submit the design skyline of any city of their choice for the year 2050. HP Skyline 2050 received tremendous response and participation from architects and structural engineers across the country. The top three designs were adjudged winners by the eminent jury comprising of internationally renowned architects and design experts – Ar. Sanjay Puri, Founder of Sanjay Puri Architects, Ar. Sunita Kohli, President, K2India Architects and Designers and Ar. Martand Khosla, Partner, RKDS. Ar. Abhigyan Neogi of Chromed Design Studio won the first prize for his futuristic project named “Traveotel “. Second and third prizes were won by Ar. Yatin Patel from DSP Design Associates and Ar. Mohit Kansal from Studio Strato for their designs named “Biomimicry” and “Mixed Use Development project” respectively. The top three winners were felicitated at an awards ceremony with an architect’s office solution comprising of an HP large-format printer, HP workstation, and Autodesk AEC software bundle. “ITP Media Group is immensely proud to have partnered with HP on this platform. Each of the riveting entries were a proof of the driving ambitions that are shaping the landscape of our future cities. The competition has opened us up to infinite latent possibilities, which can transform our nation and alter the way future generations experience the city through the lens of its skyline,” added Bibhor Srivastava, group publishing director,ITP Media.